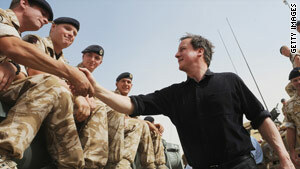 British Prime Minister David Cameron meets troops in Afghanistan on June 11. London, England (CNN) -- The United Kingdom suffered its 300th fatality in Afghanistan with the death of a Royal Marine from injuries suffered this month, the Ministry of Defence announced Monday. The Marine died in a Birmingham, England, hospital on Sunday after being wounded in an explosion in Helmand province on June 12, the ministry said. His family was with him when he died. They asked that no further information be released for 24 hours, the ministry added. At least 1,110 Americans have been killed in Afghanistan since the 2001 campaign against the Taliban began, according to CNN records.